Pressure Vessel - Taijune Enterprise Co., Ltd.
Taijune is consisted by a top group of engineering designers who provide full line pressure vessel service from designing to manufacturing. The product from us can be applied to chemical industry, petrified industry, biochemical industry, pharmacy, food, rubber/plastic and electronic, in particularly, our pressure vessel service is high efficient for operation. International industrial certification like ASME can be stamped on all the products manufactured by us. 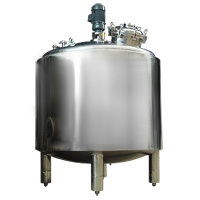 Pressure vessels are widely used in different applications in both industry and the private sector. Mostly, they applied to sectors such as industrial compressed air receivers and domestic hot water storage tanks. Some application example such as hydraulic reservoirs under pressure, pressure reactors, pneumatic reservoirs are usually in industries. We are dedicated in the field of pressure vessel manufacturing for many years; hence, we can say proudly that we're qualified manufacturer to fulfill your requirements.